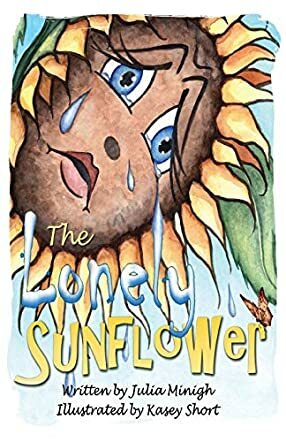 The Lonely Sunflower written by nine-year-old Julia Minigh and illustrated by Kasey Short has an eye-catching cover and will delight young readers. The sunflower is beautiful, but she is sad and lonely as she has no friends. The sunflower attempts to make friends with a bee and butterfly; however they are too busy and cannot stay with the sunflower to be her friend. The sunflower is so sad she begins to weep and her tears are falling to the ground. Suddenly, the sunflower looks through her tears down to the ground and sees that something has come from her tears! Flowers have grown around her and the sunflower is lonely no more! This is a cute story illustrating Psalm 126:5, "Those who sow in tears will reap with songs of joy," in both words and illustrations. The illustrations, on the cover and also on each page, are beautiful and fit the words on the pages perfectly. The story is simple and straight to the point. A young reader will be able to learn the meaning of the verse and also be able to relate to the story as children (and adults as well) feel lonely from time to time. This would be an excellent addition to any child's library as it illustrates a Biblical truth for young children in a way that will be easily grasped. Also, it could be used as a counseling tool for children who have recently moved or are having trouble making friends. This book is beautiful and I highly recommend it. Put in the way that a child can really understand.